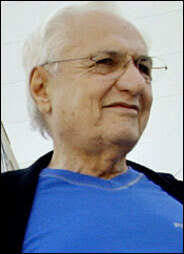 Architect Frank Gehry has been chosen to design the performing arts center at the World Trade Center site. NEW YORK (AP) -- Renowned architect Frank Gehry will design the performing arts center at the World Trade Center site and the Norwegian firm Snohetta will design the museum complex, redevelopment officials announced Tuesday. The Lower Manhattan Development Corp. announced the selection of the architects and said schematic designs for the cultural buildings would be completed in early 2005. "These dynamic architects will design fitting homes for the world class cultural institutions which will be located at the World Trade Center site," Gov. George Pataki said in a statement. The development corporation earlier this year announced the selection of the Joyce International Dance Center, the Signature Theatre, the Freedom Center and the Drawing Center to take up residence at ground zero after more than 100 arts groups applied for space there. "Selecting the architect was a privilege and a tremendous responsibility," said Linda Shelton, executive director of The Joyce Theater Foundation Inc. "We are thrilled to be working with Frank Gehry, one of the most renowned architects in the world." Catherine de Zegher, director of the Drawing Center, and George Negroponte, the center's president, said, "The Drawing Center is thrilled by the selection of Snohetta as the architect for the museum complex at the World Trade Center site. ... The stunningly beautiful architecture of this young Norwegian firm will have a natural fluency with the memorial and the surrounding buildings." Gehry is best known for designing the Guggenheim Museum in Bilbao, Spain and the Walt Disney Concert Hall in Los Angeles. Snohetta is an Oslo-based architecture, landscape architecture, and interior design company. It is known for its completion of the Alexandria Library in Egypt, the Norwegian Embassy in Berlin, and the soon-to-be-completed New National Opera in Oslo. Gehry: the world raves about this guy. Haven't seen his work other than in pictures. What do you think, folks? Good choice? Im suprised Gehry was choosen considering the criticism surrounding him following his earlier comments about the WTC redevelopment. hope he surprises us with an amaizing desighn like the new world trade center station. Well, let's look at what has happened over the past few years. Gehry prduces a cultural building, that building wins rave reviews and acclaim all over the globe, the building is now a huge destination...see Bilbao, LA, etc. Not really very surprising, actually kinda safe. I just hope it's something different than the typical medal cloud. Frank Gehry had long hesitated to accept a project at the World Trade Center site. Frank Gehry, admired for his voluptuous buildings of undulating titanium and steel, is to be the architect of a new performing arts center at ground zero, his first major cultural project in Manhattan, the development corporation in charge of rebuilding the site said yesterday. The selection of Mr. Gehry for the arts center - which is to include the Joyce Theater and the Signature Theater - brings to Lower Manhattan a celebrity architect who has been notably absent from perhaps the most closely watched architectural site in the world. "I have stayed away from ground zero," he said yesterday by telephone from Los Angeles. "It just felt like, 'I'm not in New York, it's so emotional.' "
A little-known Norwegian firm, Snohetta, whose most prominent building is a new library in Alexandria, Egypt, was chosen for the other major cultural building at the World Trade Center site. That structure is to house the International Freedom Center, which will focus on human rights, and the Drawing Center, which will exhibit historical and contemporary drawings. Mr. Gehry said that designing a building for dance and theater was what attracted him to the project, and that he had no interest in designing any of the commercial space at the site. Nor did he enter the competition for the memorial to those who died when the World Trade Center was destroyed. 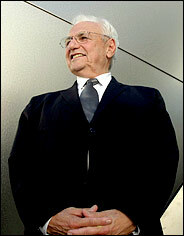 Still, Mr. Gehry said, he has always had grand ideas for ground zero. "I thought they should build a five- to six-acre covered space with gardens," he said. "It could be used by the Philharmonic, by theater - a cultural park that had the ability to be quiet and contemplative and to be used for public events." While the performing arts center is considerably more modest - 250,000 to 300,000 square feet - Mr. Gehry said he was excited about its potential. "It's a complicated project because it is a small footprint that is vertical," he said. "You will have to put theater on top of theater." Mr. Gehry and Snohetta - a relatively young firm named for a Norwegian mountain peak - are to submit their schematic designs in February, including a conceptual site plan, preliminary building plans, sections and elevations. Each of the cultural buildings was originally expected to cost $200 million to $300 million, but those involved said a more specific price tag for the projects had yet to be fixed. Also unclear is who will be responsible for the fund-raising. Tom A. Bernstein, who created the idea of the Freedom Center, said he expected to raise most of it. "The lion's share of the fund-raising will be on us," he said. Mr. Gehry said that he had been asked by the development corporation to make appearances to help the fund-raising, and that he had agreed, as did Snohetta. At the performing arts center, the Joyce International Center for Dance will be a 900- to 1,000-seat theater, distinct from the Joyce's current sites in Chelsea and SoHo. The Signature Theater Center, which on West 42nd Street has devoted each season to a single playwright, plans a three-theater complex. The arts institutions themselves selected the architects, together with the development corporation, the Department of Cultural Affairs, the New York State Council on the Arts and other consultants. Mr. Gehry said he was well aware that the trade center site has been fertile ground for conflicts among developers and architects. But he said he believed he could work with the others who are already in the mix. "I'm excited about Santiago's building," he said of Santiago Calatrava's transportation hub, and added, "Michael Arad and Peter Walker's memorial, I'm pretty comfortable with that." As for David M. Childs, the architect whose Freedom Tower practically abuts the performing arts center, Mr. Gehry said, "David and I are reasonably good friends." For now, the rebuilding plan calls for the loading docks for Mr. Childs's Freedom Tower to be situated in the performing arts building. Asked whether he felt comfortable with that, Mr. Gehry said he had not been aware of it. "I don't know what I've got myself into yet," he said. Linda Shelton, the executive director of the Joyce, said that Mr. Gehry's self-confidence was part of what gave her confidence in him. "It's a tough place to work in because of all the buildings that are around it," she said. "And I just felt that he could hold his own." Mr. Gehry was raised in Canada, but he said his father was born in Hell's Kitchen in New York. Looking out over ground zero recently from the development corporation's offices, Mr. Gehry said the emotional impact of the site overwhelmed him. "The fact that I couldn't contain tears the other day means this is much more loaded for all of us than we really understood," he said. The other cultural building is to be 250,000 to 275,000 square feet. Aside from the new Egyptian library, Biblioteca Alexandrina, Snohetta has designed the Norwegian Embassy in Berlin, the almost completed National Opera in Oslo and the Turner Contemporary Museum in Margate, England. This will be the firm's first project in the United States. "To have some of the spirit of Norway come to ground zero is a big deal," Mr. Bernstein said. "It sets the tone for what we want to develop." Craig Dykers, a partner at Snohetta, said the project would be a challenge in that it is the only building to be situated directly on the memorial itself. "It should be a building that is open and clear and has a relationship to the memorial that is respectful, but is also lively," he said. Mr. Gehry said that he had not submitted a proposal for the Freedom Center, but that he would have had it been an art museum. "That wasn't interesting to me," he said. His other cultural projects include the Guggenheim Museum in Bilbao, Spain; Walt Disney Concert Hall in Los Angeles; the Richard B. Fisher Center for the Performing Arts at Bard College in Annandale-on-Hudson, N.Y.; and the Jay Pritzker Pavilion, an outdoor music stage in Millennium Park in Chicago. He is to design the proposed Nets basketball arena in Brooklyn, and, with Hugh Hardy, a theater next to the Brooklyn Academy of Music. Mr. Gehry also designed a New York headquarters, currently under construction, for the Internet- and television-shopping magnate Barry Diller in Chelsea, and he said he was doing studies for a luxury high-rise across from Pace University. The ground zero project would seem to be a major accomplishment for Mr. Gehry, but he said, "I don't covet jobs; I don't go after things." Mr. Gehry was to have designed a $950 million downtown branch of the Guggenheim Museum on the East River, a project abandoned because of finances. He designed a possible glass enclosure for Lincoln Center's fountain plaza, which was ultimately rejected by the Metropolitan Opera and Beverly Sills, then Lincoln Center's chairwoman. Mr. Gehry's firm and Snohetta were among 68 architectural firms that submitted their proposals in August. They were chosen from a short list that included Rem Koolhaas, Daniel Libeskind, Polshek Partnership Architects and Rafael Viñoly Architects. Mr. Gehry said that he met with the performing arts companies and members of the selection panel on Sept. 27, that they in turn visited Disney Hall and his offices on Oct. 1, and that he flew to New York City on Sunday to meet with John C. Whitehead, the chairman of the Lower Manhattan Development Corporation. Mr. Gehry said he had not yet come up with any concrete structural ideas. "I don't like doing those sketches," he said, adding, "they're so trivial because you haven't had the chance to work with the client." Mr. Dykers of Snohetta had slightly more of a conception of what his building - on the northeast corner of Fulton and Greenwich Streets - should look like: "Simple, very unassuming and perhaps unimposing. But we would also like it to be memorable and to provide an identity for that corner. "It should be a building that doesn't distract from the memorial," he said. "A building that is almost invisible." Yeah, I'm picturing a metal cloud too, but for this site it's better than his other typical design: a building that looks like it just went through a catastrophic earthquake. The city is looking to take over the stalled effort to design and build a performance center at the World Trade Center site. Dep. Mayor Daniel Doctoroff, who oversees Lower Manhattan rebuilding, told Downtown Express that the city is probably the best group to work with famed architect Frank Gehry on the design for the Performing Arts Center near the Freedom Tower, because the group slated to fundraise, own and manage the center, the World Trade Center Memorial Foundation, is focusing on raising money for the memorial. Doctoroff said when it comes time to raise funds for the center, it may be better to set up a new fundraising organization rather than have the foundation run both the memorial complex and the cultural building. “It might be a separate entity to run and manage the performing arts center,” he said in a telephone interview July 26. The arts center is to house the Joyce and Signature Theaters and would have at least one 1,000–seat dance theater and an undetermined number of smaller theaters for Signature. Assembly Speaker Sheldon Silver, whose district includes the site, said because the city and state have wasted so much time keeping the center on the backburner, it is now better to wait another five months when he expects, and polls suggest, that state Attorney General Eliot Spitzer will become governor. He said it sounded like a last-minute plan to ensure that Spitzer will have less influence on the site. Doctoroff and Mayor Michael Bloomberg led the effort to build a New York Jets/Olympic stadium on the far West Side until Silver and state Sen. Majority Leader Joe Bruno defeated the project last year. The Lower Manhattan Development Corporation, the agency overseeing the rebuilding, announced Tuesday it would disband in a few months, prompting discussion about the future of the center. The L.M.D.C., which has clashed with the foundation in recent months over the PAC, has allocated most of the $2.78 billion of federal money it was given to help Downtown rebuild. It has set aside $50 million for the arts building and it is unclear where that money will go when the agency closes sometime in the next few months. L.M.D.C. president Stefan Pryor said Doctoroff’s ideas are the “ideal” way to get the art center built. L.M.D.C. staffers have been consulting with Gehry’s team about designing the PAC’s complex underground area, he said. The Port Authority of New York and New Jersey, which owns the site, is building a temporary PATH commuter station at the PAC site to replace the current temporary PATH station while construction on the permanent Santiago Calatrava-designed station continues. The L.M.D.C. warned officials a few months ago that the Port was eyeing a large part of the PAC site for a train station exit because the performance center project was on hold. The memorial foundation has never been enthusiastic about the PAC, failing to even set a date to begin fundraising for it until after all $510 million needed for the memorial and museum was raised. Madelyn Wils, an L.M.D.C. board of director, said the aboveground performance center would cost around $200 million, of which about $50 million would come from the L.M.D.C. She said the Port Authority should pay for the underground infrastructure costs, which are likely to be expensive. Culture uses have had a difficult time finding a place at the Trade Center site. Last summer, plans for a cultural center adjacent to the memorial disintegrated when the Drawing Center, a Soho-based museum, pulled out from the development after sustaining weeks of intense criticism from local press and some victims’ family members. Later in the summer, Governor George Pataki banished the International Freedom Center, a museum created explicitly for the cultural center, from the memorial quadrant for similar reasons. The museum building site will now be used for a state-funded, $80 million visitors center for the memorial. Tom Healy, president of the Lower Manhattan Cultural Council, said he was happy to hear the city wanted to separate the cultural center from the memorial, but he thought the fundraising effort needed to begin now. “You don’t have a memorial running a performing arts center,” said Healy, whose non-profit organization runs art programs Downtown and also supports small arts organizations. He said it is important to set up a fundraising group now and enlist corporate donors to participate in the design process to protect the project when things get rocky. He said the reason the Drawing Center and Freedom Center were bounced was that there was no private group to rally support when 9/11 family groups objected. “The idea didn’t belong to people,” he said. Does this guy ever drop a grudge? Did he not make a loud enough statement last summer when he put the needs of one district above those of any other in the city? What of the delays caused by the Port Authority? By the NYPD? By the LMDC? Yes, Shelly, I'm sure the performing arts center would have been the first thing built on the site if it wasn't for Hudson Yards, promptly followed by every other project that's been continuously stalled. I'm absolutely sick of this guy. My question is, when does Lower Manhattan get a new representative? Okay, now that my rant about Silver is done, I have another question: does anyone here honestly believe that an arts center by Gehry will cost only $200 million? No way $200 M will cover that building. But I do think it is a great idea to get PAC away from LMDC / Memorial. Also: Bloomberg is a huge champion of Public Art so this might be a good match -- Mayor Mike can throw his millions into the mix -- if he does I'd even say we should call it the Bloomberg Center for the Performing Arts. Right now, members of the Joyce Theater are keeping their fingers crossed that the sky will be clear tonight, when they are scheduled to present the first of several free evenings of dance in Battery Park. In the long term, however, more than uncertain weather is hanging over the Joyce's future downtown. Five years after the attacks of September 11, 2001, the planned performing arts center at ground zero is without either institutional leadership or a fund-raising campaign. The Lower Manhattan Development Corporation, which until recently was overseeing the cultural development at the site, is closing its doors soon. The impetus for a cultural component at ground zero emerged from a public outreach campaign sponsored by the development corporation in the wake of the attacks. A performing arts center was part of the winning design for the site by the architect Daniel Libeskind. While the city has indicated that it will play a role in overseeing construction of the center, it hasn't specified what that role will be. This leaves the arts groups chosen to occupy the center — the Joyce and the Signature Theatre Company — in the dark about when it will actually be built. But the leadership, funding, and schedule for the construction of the performing arts center remain up in the air. This much is known: The center will be designed by the world-renowned architect Frank Gehry and is to include a 1,000-seat theater for the Joyce and several theaters of varying sizes for the Signature. No final budget or design has been publicly announced. The development corporation has committed $50 million to the construction, but the budget will certainly surpass that. (Mr. Gehry's Walt Disney Concert Hall in Los Angeles cost $274 million.) The Andrew W. Mellon Foundation has made grants of $1.2 million each to the Joyce and the Signature to support their move downtown, grants that each institution is supposed to match within three years. The task of raising the rest of the money is assigned to the World Trade Center Memorial Foundation. The foundation is focusing its efforts now on raising money for the World Trade Center Memorial and Museum, which are scheduled to open in September 2009. The acting president of the foundation, Joseph Daniels, said the foundation's board decided in July 2005, to split the general fundraising campaign into two phases, the first for the memorial and museum and, when that is completed, the second for the performing arts center. "The underlying rationale for splitting this up into two phases was to make sure we concentrate on the memorial and the museum first," Mr. Daniels said. "Where we are now is, we've got $170 million to raise for this museum, and that's certainly where our fund raising is focused." The president of the development corporation, Stefan Pryor, said while no budget has been announced, the corporation has its own number that it is working with internally.As for the state of the design, he said that the Gehry team has done some design work and that the corporation has done "extensive work" to design the below-ground component of the site. Last November, Mr. Pryor announced a search for a director for the center. Asked if the search had fallen between the cracks, Mr. Pryor said: "I wouldn't say that. I would say that we have chosen a direction, which is that the city of New York will be leading the efforts to create the performing arts center. The city will be determining the staffing structure and the staff members to conduct that work." Since the development corporation announced that it was closing down, he explained, the city "in discussions with us made the determination that they will spearhead the effort." Official comments have been less clear. Deputy Mayor Daniel Doctoroff has said the city would be the best group to oversee the performing arts center, and suggested that, because the Memorial Foundation is focused on the memorial, an additional fund-raising organization should be set up. But last week, Mr. Doctoroff's office referred calls to the New York City Cultural Commissioner, Kate Levin, who would not elaborate on the city's role beyond saying "the City is committed to seeing that the cultural components of the site are fulfilled." The directors of the Joyce and the Signature both declined to comment. This will never get built as planned. Plans to build a performing arts center at Ground Zero - the only element of the site that isn't office space or the World Trade Center memorial and museum - may be delayed by new security concerns, the Daily News has learned. Originally slated to debut in 2009 or 2010, the arts center could have its opening postponed by a terror expert's recommendation that the site needs an emergency access lane to underground parking areas. A security plan drawn up by ex-New York FBI chief James Kallstrom, now Gov. Pataki's anti-terrorism czar, calls for the permanent lane to be built near Vesey and Greenwich Sts. - right where the arts center is supposed to one day rise, according to officials close to the rebuilding effort. The change might alter the construction schedule for the arts center. The underground parking sites are for buses and other vehicles visiting the WTC memorial and office towers, and will be accessible to the public only through a vehicle security center below Liberty St. The Port Authority plans to open the first phase of the $585 million security center, with parking for 28 buses, in 2011. The agency had no comment yesterday on the access lane from Vesey St. except to say it's reviewing the recommendations. If approved, the lane would be the second development affecting the arts center site. Starting early next year, the site will be largely occupied by a temporary entrance to the PATH station that's due to remain in place until a new terminal opens in 2009. The arts center will be designed by Frank Gehry, and occupied by the Signature Theatre Co. and the Joyce International Center for Dance. Downtown Community Board 1, irked by the wait for the arts center, recently called for a start to fund-raising so there will be "some practical assurance" that it will "actually be built." The board made the plea after the Lower Manhattan Development Corp. allocated up to $55 million to the city to design and build the facility. Last week, the LMDC cut the center's maximum seating capacity from 2,200 to 1,800. All contents © 2006 Daily News, L.P.
Last week, the LMDC cut the center's maximum seating capacity from 2,200 to 1,800. Cultural institutions were supposed to be an integral part of the planning; now we can't even get a 2000 seat facility built. They should have built it at the Fiterman site, with BMCC space above.